Det Lille Hotel calls the seaside town of Risør, Norway home. The town is known as the Wooden House Town due to its array of wooden homes built in the 1800s that are still used to this day. The hotel’s current iteration began in 1910, with just one suite. It has now grown to over 15 suites throughout the town, with gorgeous views of the water and countryside. The oldest building that houses a suite dates back to 1750. The suites at Det Lille Hotel all offer a home away from home, with full kitchens, private bedrooms, and living areas. Views can be of the sea, beautiful country side, or the hotel’s heated pool. Guests are welcome to enjoy the bountiful breakfast laid out each morning in the dining room in the main building. As the town is known for its seafood, guests can request tailored menu for their own choice of food. 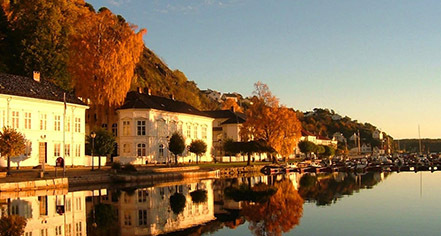 The hotel also offers guided tours around the Risør town center and provides bikes for guests wishing to explore on their own. Locally, there are several historic sites to visit and family fun to be had. Visit the local zoo and maritime museum. Get a glimpse into the past at the Bornholms Museum or the Ceramic Museum. Take a long bike ride around the city to the Slid pools for a relaxing swim. Food and wine tours are held daily and all a Det Lille Hotel guest needs to do is contact the front desk for tickets. Det Lille Hotel, a member of Historic Hotels Worldwide since 2018, dates back to 1750. The hotel is in the municipality of Risør, which is an Old Norse word that translates to “thicket island,” a reference to the early days before the area was fully settled. Cribs and Pack-in-Plays: Cribs are available for 100.00 DKK per day. 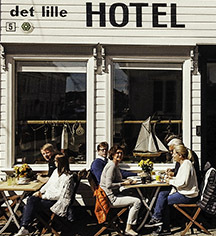 Det Lille Hotel calls the seaside town of Risør, Norway home. The town is known as the Wooden House Town due to its array of wooden homes built in the 1800s that are still used to this day. The hotel’s current iteration began in 1910, with just one suite. Learn more about the History of Det Lille Hotel .